CROSBY CERTIFIED VEHICLE! ACCIDENT FREE! TWO NEW TIRES! WELL LOVED! 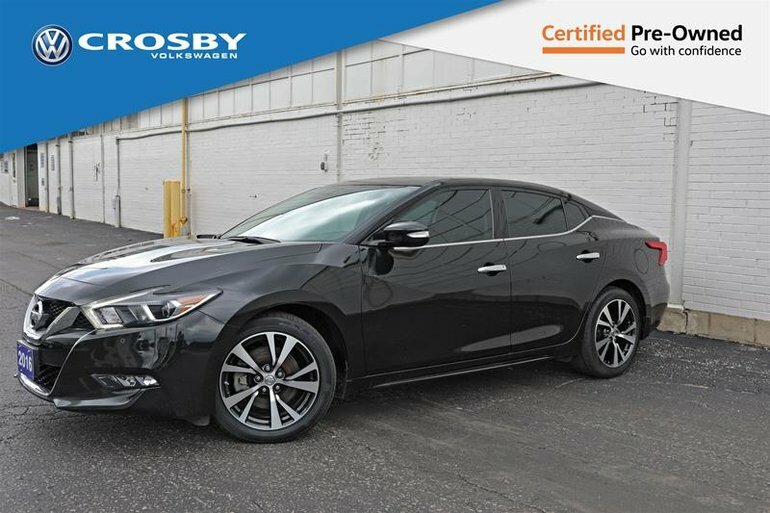 Additional features include: 18” alloy wheels, power mirrors, heated mirrors, nissan connect, cruise control, leather wrapped multifunction steering wheel, leather appointed seating, dual climate control and an automatic transmission This 2016 Nissan Maxima has never been in an accident and has been reconditioned to pass our comprehensive Crosby Certified 63 point inspection. We have performed an oil change, replaced the wiper blades, and installed two new tires. Call 1-866-403-2834 or send us an email to find out more! We’re only a 50-minute drive from the West GTA. Going to come down for a test drive? We know your time is valuable; we’ll make sure the vehicle is cleaned, fueled and ready to go upon your arrival. Crosby Volkswagen, Kitchener, 1-866-403-2834, www.crosbyvw.com. Serving Kitchener, and surrounding area since 1966. Our prices are inclusive - only HST, and licensing is additional. Interested by the 2016 Nissan Maxima 3.5 SV CVT ?